Rio Tinto, which has headquarters in Australia and the UK, is the second-largest mining company in the world. 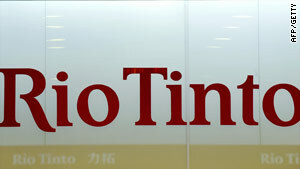 (CNN) -- An attorney for one of four employees of mining giant Rio Tinto, on trial in Shanghai, China on charges including bribery and stealing commercial secrets, said his client admits to taking money but said it was a gift or a loan, not a bribe. The defendants include Stern Hu, an Australian citizen of Chinese origin who is the general manager of Rio Tinto's Shanghai office. A court debate is scheduled for Tuesday on the bribery. The attorney, Zhai Jian, said he was not sure how long that would take, or when a verdict could be expected. The case has raised fears of a government crackdown on foreign companies doing business in China. Hu and the others were detained in July. Obtaining commercial secrets carries a maximum penalty of seven years in prison upon conviction. The trial was being held in Shanghai No. 1 Intermediate Court. "Rio Tinto reiterates its hope for a transparent and expeditious process for its employees," the company said. The detentions took place about a month after Rio Tinto broke off a more than $19 billion investment deal with China state-owned Chinalco. The deal with Chinalco was signed in February 2009 and was awaiting a review by Australia's foreign investment board. The deal soured as opposition party members in Australia ratcheted up their disapproval, saying it would put Australian resources at strategic risk. Others saw the deal as an alliance that would further link resource-rich Australia with the commodities-hungry Chinese market. While the earlier deal fell apart, the companies signed an agreement Friday to form a joint venture to develop an iron ore project in the West African nation of Guinea. Chinalco will pay $1.35 billion to enter the partnership. China warned against making too much of the case. "It is just an individual business case. It should not be politicized or bring a negative impact on Australia and China relations," said Qin Gang, a foreign ministry spokesman. But Australian Prime Minister Kevin Rudd said the case will have his full attention. "China has a different legal system to the rest of the world," Rudd said Monday. "The world will be watching very closely."